At a distance of 6,000 light years from Earth, the star cluster RCW 38 is a relatively close star-forming region. This image covers an area about 5 light years across, and contains thousands of hot, very young stars formed less than a million years ago. 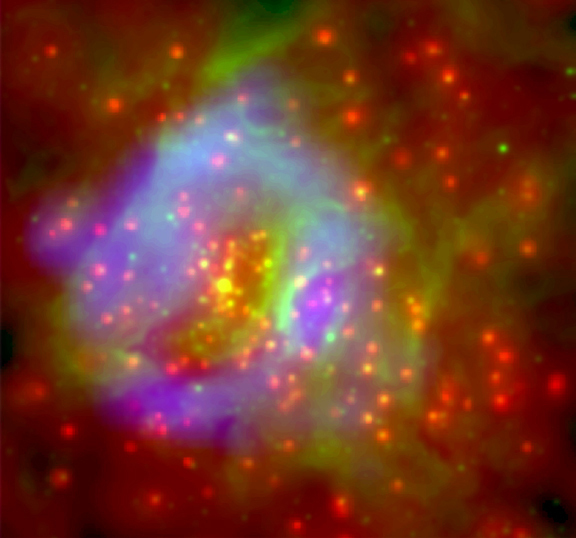 X-rays from the hot upper atmospheres of 190 of these stars were detected by Chandra. 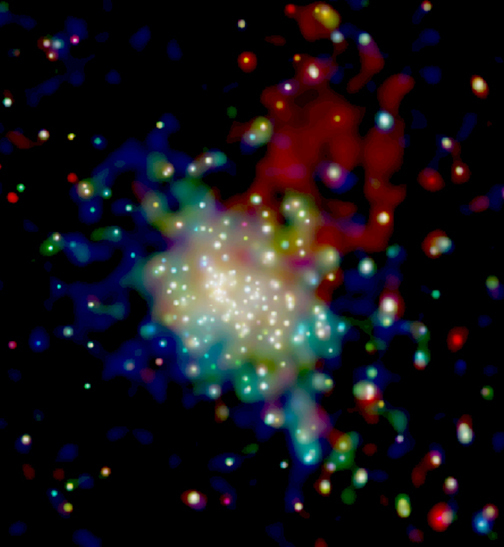 In addition to the point-like emission from stars, the Chandra image revealed a diffuse cloud of X-rays enveloping the star cluster. The X-ray spectrum of the cloud shows an excess of high-energy X-rays, which indicates that the X-rays come from trillion-volt electrons moving in a magnetic field. Such particles are typically produced by exploding stars, or in the strong magnetic fields around neutron stars or black holes, none of which is evident in RCW 38. One possible origin for the high-energy electrons is an undetected supernova that occurred in the cluster. Although direct evidence for such a supernova could have faded away thousands of years ago, a shock wave or a rapidly rotating neutron star produced by the outburst could be acting in concert with particles evaporating off the young stars to produce the high energy electrons. Regardless of the origin of the energetic electrons, their presence could change the chemistry of the disks that will eventually form planets around stars in the cluster. For example, in our own solar system, we find evidence of certain short-lived radioactive nuclei (Aluminum 26 being the most well known). This implies the existence of a high-energy process late in the evolution of our solar system. If our solar system was immersed for a time in a sea of energetic particles, this could explain the rare nuclides present in meteorites found on Earth today. Scale Image is 8.1 arcmin on a side. Coordinates (J2000) RA 08h 59m 19.2s | Dec -47° 30' 22"